Housecleaner Ana Avilez initially learned of MEDA’s Mission Techies program while watching Univision with her family one evening. Then Ana was introduced to MPN at a 7 Tepees resource fair, so she decided to make an schedule time to come to MEDA’s Plaza Adelante. As Ana headed upstairs to her appointment, she saw a Mission Techies flier by the door of the Digital Opportunity Center. Her attention was piqued. Ana headed into the tech center and was greeted by Technology Training Coordinator Leo Sosa, who explained the free program and asked Ana if she could commit to the time required. After discussing this opportunity with her mother, husband and employers, Ana diligently stuck to the three-month commitment and graduated from the Mission Techies program. “The interesting thing is that ‘Ana’ means perseverance,” states Sosa. As a Mission Techie, Ana (pictured) took the first step into the MPN community. She was referred to Early Learning Family Success Coach Ada Alvarado, who helped Ana enroll one of her daughters in a bilingual preschool in Potrero Hill. Ada noticed that Ana was always prepared and on time to every meeting with Children’s Council and Potrero Kids. 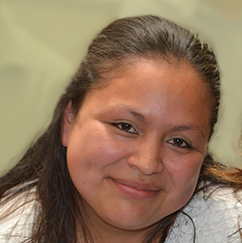 As MEDA staff worked with Ana, they recognized the community member’s leadership abilities, eventually referring her to the Mission Promise Neighborhood Community Advisory Council. Ana and other parents now advise the community about Mission Promise Neighborhood’s work and share opportunities to support their children. “I’m fortunate to have been introduced to and work with such a driven person, now on the path to achieve her dreams of academic and economic success for herself and children,” says Alvarado. 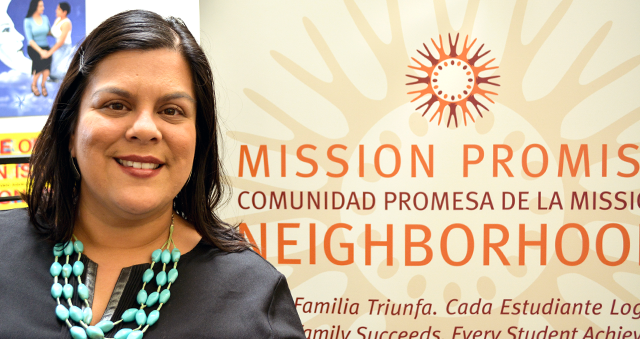 When MPN was asked to partner with SFUSD to lead Making Connections—a digital literacy course for parents that teaches how to use myON, an online reading platform for students — Mission Promise Neighborhood Director Raquel Donoso turned to Sosa for a promising, bilingual instructor. With her experience as a mother of two young learners, complemented by her technology background, Ana was chosen for the opportunity. She is now working with MPN Education Manager Laura Andersen to build these courses for parents, closing the digital divide and providing access to supplementary tools at home so that all students can continue building their literary skills. “Ana’s example of accessing the supports she needed, which turned into new personal and career opportunities, has been inspiring. Ana seeks to replicate the strong community she has found, at MEDA and her pre-school, with all of the parents in Making Connections,” explains Andersen. Welcome to the MPN team, Ana! Keep an eye out for Ana in the community. Watch a video of Ana’s inspiring story. In December 2012, MEDA worked with city agencies and 26 neighborhood partners to be the honored recipient of a $30-million federal Department of Education grant to replicate New York’s successful Harlem Children’s Zone in the Mission District of San Francisco. The goal of the Mission Promise Neighborhood (MPN) is to guide students on a cradle-to-college-to-career continuum, while helping their families achieve economic success. Raquel Donoso, Director, Mission Promise Neighborhood, is now spearheading this innovative initiative. What background do you bring to leading the Mission Promise Neighborhood? I was a mom at 18 when I was an undergrad at UCLA. This meant I had to weave my way through a maze of public assistance, from Medi-Cal to WIC. I also received state-subsidized childcare. Luckily, staff at UCLA helped me find my way. I see my personal experience at UCLA as a microcosm of what we are trying to do with the four target schools of the Mission Promise Neighborhood. Once I had my son, I switched my field of study from Biology to Anthropology and Chicano Studies. I then earned a Masters in Public Health. When I am now at policy meetings, I can literally bring to the table my experience in applying for services. I empathize with how overwhelming this can feel for our families. My goal is to remove barriers and increase opportunity, as was done for me. What is the greatest challenge of the Mission Promise Neighborhood? The gentrification in the Mission has added an extra layer of complexity to the Mission Promise Neighborhood. Many of our families have children who go to school in the Mission, but live elsewhere. It then becomes difficult to avail the families of services. Our Family Success Coaches work with many people who are losing their homes. These families are then left with the difficult choice of whether they should move away to somewhere more affordable. A lack of stable housing creates a challenge for the implementation of a place-based strategy. What are the greatest successes of the Mission Promise Neighborhood to date? We have been able to rally dozens of organizations, the school district and people at City Hall, so that everyone sees the possibility of positive outcomes for our families and students. It takes time to build a foundation, but this is in the works. The tech tools we have for our Evaluation team means pertinent data can now be had about our clients. This is being rolled out to our Mission Promise Neighborhood partners. We are also focused on a two-generation approach, providing financial opportunities for parents and educational support for their children, leading to even greater community sustainability. Integrating family financial support is a contribution MEDA brings to the table, demonstrating a model for other neighborhoods. What is your vision for Mission Promise Neighborhood after its initial five-year grant? I know that with the support of the community, great things will happen. There will be a fully integrated, shared database to better examine the comprehensive community need. We will be able to look at things at a granular level–for example, knowing that a student has started to showcase chronic absenteeism–so that there can be early intervention for an issue before it becomes a chronic problem. There will also be increased support for a college-going culture. That is already starting. With our two-generational approach, as families succeed the students achieve. This is a simultaneous process. Students begin to see opportunities. They then seize these opportunities. That is my vision. MEDA is proud to announce that the renowned California Emerging Technology Fund (CETF) has named our Technology Manager, Richard Abisla, a “2014 Broadband Champion.” Richard is being recognized for his hard work to close the growing digital divide. The champions were selected by CETF in consultation with dozens of broadband leaders, community advocates and policymakers. Richard’s first foray into closing the digital divide was when he worked with an indigenous rights group in the Central American nation of Honduras to set up a computer lab and create project-based computer training curricula. This experience laid the groundwork for his current role as project manager of MEDA’s Latino Tech-Net. Richard has the laudable goal of getting every family in the neighborhood digital access. “Really this award is for the whole great technology team we have in place here at MEDA, including Erica Castillo, our Broadband Coach, and Leo Sosa, our Technology Training Coordinator,” Richard explains. Richard was the impetus behind MEDA’s successful “Get Connected!” classes, with the next such FREE event scheduled for Saturday, May 17th, at Plaza Adelante. This popular event brings in tech-industry and other interested volunteers to teach basic digital skills to low- and middle-income Mission District residents. “Our ‘Get Connected!’ event in February trained over 100 adults and kids. We are hoping to connect even more Mission families at our May event. These classes are a big part of our vision of having the entire neighborhood enter the digital world,” states Richard. Keep up the great work, Richard! MEDA is about solutions.